Etiquette's a jungle, and there are any number of ways to find yourself on the wrong side of both Miss Manners and your social circle. I made the most embarrassing social faux pas of my life when I was about 14 years old and ran into a classmate and her father at the grocery store. When she said "Hi, Emily!" with great friendliness, I responded "Good to see, you Jessica!" I immediately realized my mistake and tried to correct it. "I'm sorry, Sarah. I know who you are." At this point, her father leaned in and said, "It's Yvonne." While I have never had another experience that bad — partially because in response to this embarrassing incident, I got in the habit of saying "Hi, YOU!" to anyone I ran into outside of their usual context — this was by no means the last time I couldn't place the name of someone who knew exactly who I was. That's because a memory lapse of a name — even for someone you know fairly well — happens to every single person on the planet. Owning your mistake and being willing to laugh at yourself can help humanize you. It actually takes courage to own up to your memory lapse or wrong-name-calling mistake. You look much better for acknowledging that you are not perfect, and that can disarm even the sourest of socializers. Don't be like me, though. If you're not sure of the name of someone you know you have met, a quick, "Forgive me, but can you remind me of your name?" paired with a charming smile can smooth over the awkward situation while making you seem endearing. This is one of the most deeply-entrenched etiquette rules for the workplace, but I know very few professionals who have not broken it at least once. Letting frustration, sadness, or anger be expressed through tears is often considered career suicide (although there does seem to be more judgment of women who cry at work than men). While it's true that professionalism does require at least some distance between our emotions and our actions — we can't go all Will Ferrell when things get too hard at the office — the no-crying-at-work rule can seem like an impossible expectation when we spend a third of our lives and most of our energy there. But when tears indicate weakness and unprofessional emotions, it's difficult to bounce back from a crying jag in copy room. Actually, crying at work can do a lot of good. According to Peggy Drexler of The Daily Beast, "People tend to connect with what they view as an authentic display of emotion. Often, crying invokes in coworkers and employees a natural empathy and a desire to help. Tears can also be persuasive: they show that we're deeply moved, which in turn moves our audience." Tears can indicate how deeply you care about an issue at work, or how overwhelmed you are by life issues that are affecting your work — and that can help your coworkers and boss have a better understanding of you and your situation. In addition, crying can help clear the air when something is festering at work. That is not to say that crying at work is always a good thing. But if you are generally a well-respected employee with a professional demeanor, finding yourself overcome by tears could help to make a point that your words cannot. According to traditional etiquette, one should never mention gifts on an invitation. That's because the mention of gifts suddenly puts an emphasis on them, and the word magically turns your invitation into a shakedown, even if all you are trying to do is stop the endless flow of stuff into your life. Even the evasive "Your presence is our present!" is considered to be rude, as it seems to make the suggestion that the invitee owes a present at all. This is a situation wherein etiquette simply has not kept up with social conventions. It's all well and good for Miss Manners to claim that no one is thinking about presents when they are invited to a wedding or a birthday party, but we know that's not the case. The social expectation is that you bring a present to a party. No one needs to say it for the expectation to be there. In fact, the real problem with "No gifts" on party invitations is that people don't know what it means. Some believe that the host is angling for money or gift cards, and others bring gifts for fear of being the only non-gift-giver at the party. So take the etiquette bull by the horns and give your guests an alternative to gifts. Specify a charity you would love your guests to support in lieu of a gift. Request that each person bring a funny story about or a picture of the guest of honor. Make it a Hobbit party, where all the guests get a present, rather than the birthday child. Miss Manners might recoil, but spelling out exactly what you expect to happen (non) gift-wise will be an incredible relief to your guests. They know that there is a social gift expectation for a party, but they have no idea what "No gifts" means unless you make it perfectly clear. Doing this will help your guests to think of you as a selfless and fun host, rather than someone who impolitely mentions gifts on an invitation. 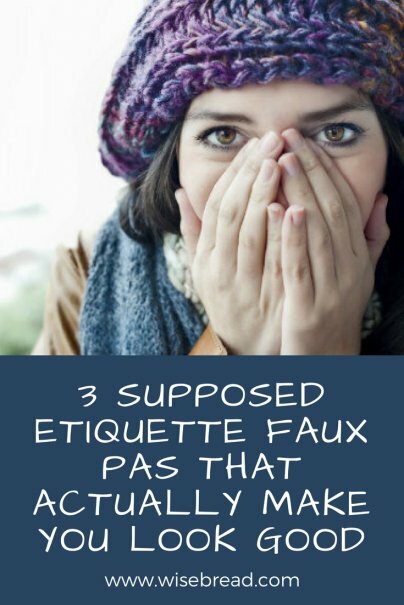 All three of these faux pas are really about being your genuine and authentic self. Own these "errors," and know that others will likely respect you even more for them. Which etiquette rules have you broken only to have your social standing improve as a result? Be polite and share in comments! Number two is just as bad as number one, but still happens to the best of us! OR we could all, OMG, LEARN ETIQUETTE! If we BOTH know our etiquette, then I will be sure to mention my name to you if you seem to be floundering. The "no gifts" thing has, in my opinion, no place in personal relationships. If that is your wish, the GRACIOUS way to accomplish it is for others to spread the word, like when guests call to RSVP and so on. PS: Crying at work to me is NOT an etiquette issue, or at least not on the part of the cryer. Specifying on an invitation a charity to which you want guests to donate is trolling for a specific type of gift and is not ok.